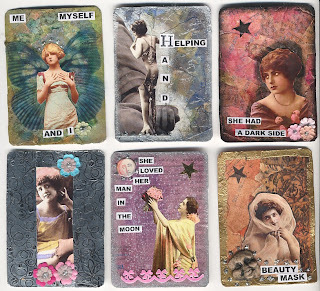 more ATCs. It's greyt to be back in a creative mood and producing. Some ATCs that I've recently made 4 some 1-2-1 swaps. Has been absolutley ages since I've made any. Have been absent from updating this blog for a while,but I've still been visiting all of you, and trust that you are all keeping well and being crafty. 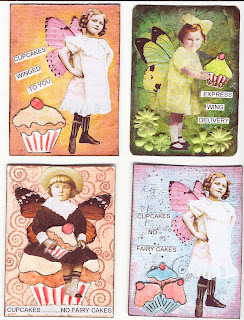 Haven't been that creative lately so decided to make some ATCs for a cupcake swap I'm participating in. Today KARI aka ARTSYMAMA is having a ARTFUL BLOGGING PARTY where most of the guests on their blog have done a blogging tutorial . Go and drop in on her blog and see all the wonderful tutorials the bloggers are putting on their blogs. I haven't had time to do a tutorial so I just thought I would send a post card to all the gals from Cesenatico in Emilia Romagna, Italy., but still keep it in the artistic theme. 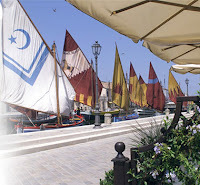 These postcards are of the Port in Cesenatico which was designed by Leonardo da Vinci, and all the old fishermen boat sails that you can see are painted. Part of the port has been made into a floating museum. There is also a Cesenatico artist who uses the old ruined plain sails and does mixed media art on them ..........they look fantastic. Well I'm off to have a butchers at all the blogs now, so no house work will be done today !!!!!!! don't tell hubby. Here is an ATC that will be winging its way to Australia. 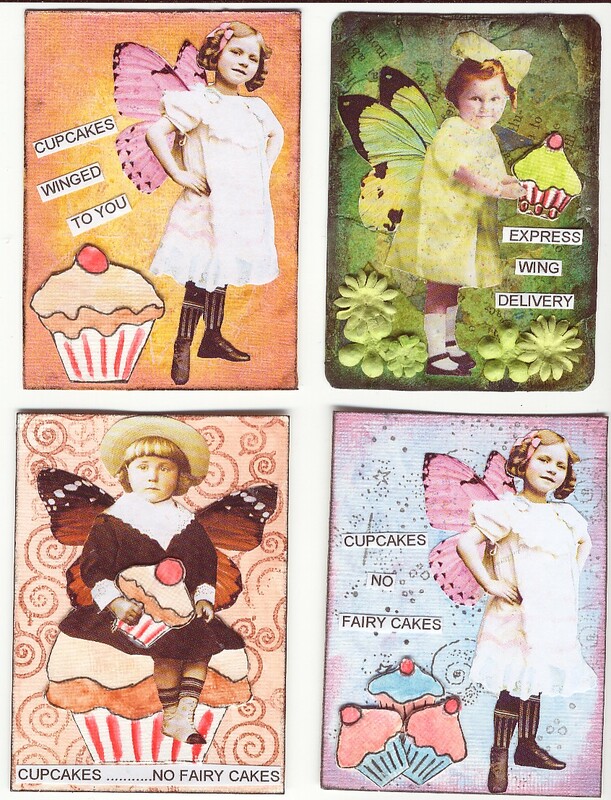 Stamps by cherry pie and firecracker designs, stamped onto water colour paper and painted with watercolours. Images then applied onto a piece of vintage wallpaper and some paper flowers added. 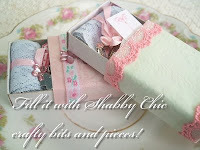 Hi there, Natash Burns from downunder is hosting a Shabby Chic Matchbox swap, see her blog for details. Sign up day ending 15.06.2007 posting out by 22.06.2007. Seems there are a whole nice bunch of swappers taking part. 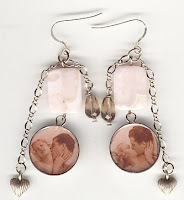 These are a pair of earrings I have been commissioned to make. I have used a scanned vintage image from my postcard collection , sterling silver earwires and hearts and precious stones. I would also like to send many comforting hugs and friendly kisses to a dear artistic friend in the USA , who was over the moon with some fantastic news only to be kicked in the gut with some bad news and now she will have to wait for some rusults to confirm the outcome, which must be terrible. I'm keeping my fingers crossed that the news will again be good. She deserves some good in her life as she has always had to struggle with each day. Wish I could be there to comfort her and hubby. Saturday evening I made 8 flowery charm bracelets, seem to be going thru a fad of making these bracelets with these specific beads. I have been buying some from an American e-bayer 'princess by design' as some of these beads I just can't find here in Italy. 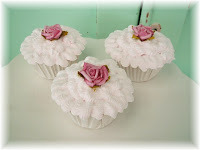 I am making some more for 2 special people in America , can't say whom yet, but I know they often look at my blog. Just hope they like what they see here as it will be something similar. Am also thinking of starting an etsy shop to sell some of my creations, up to now I've never had the courage as I've seen so many greyt things about that I've never felt up to standard. Me thinks now is the time to try if they sell, they sell if not I tried. Here in Italy it's very hot, sticky and humid already, to think summer hasn't started yet !!!!!!!!!!! OMG. 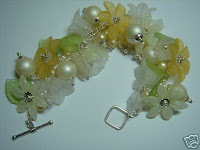 Today has been very hot, so I went downstairs into my studio and decided to make a bracelet with some flower beads. I got carried away and in the end I made 4 bracelets. Here's one of them. These are the only flowers that survive in my house......I don't have green fingers !!!! This is an AATC , a what? 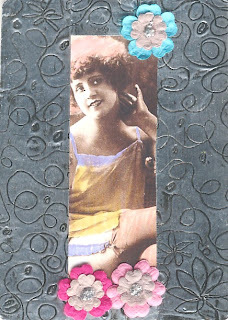 an AATC = an altered artist trading card. I made this ATC a year back and I wasn't over the moon with it, something just wasn't right. I received some rubber stamps last week from firecraker designs and decided to add some of their stamped images to the ATC and for me this time it worked out and I was happier with it. The ATC background was done using a stamp ink pad on paper for acrylics, then doodled over and a vintage image added, then after one year altered . 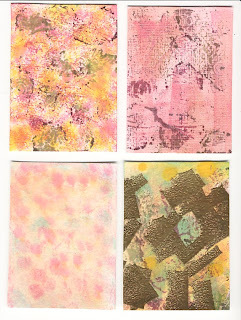 I made these ATCs using Cherry Pie rubber stamps coloured in with watercolurs and put onto a black cardstock background. My chain ATCs will go out on Saturday. Made my first CUPCAKE ever with a lemon frosting topping and have to admit wasn't bad for a first try, made 20 at lunch time and by early evening all were gone.................wasn't me who ate them all !!! Luckily I managed to get a photo before they all went, only prob whilst looking for the camera I left them outside under the sun and the frosting strarted to melt !!!!!. 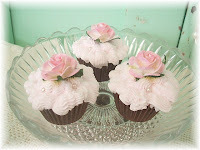 I have fallen in love with the faux cupcakes and cakes and all those wonderful blogs and websites..........actually I'm falling in love with PINK , I'm beginning to THINK PINK and liking all that shabby chic. Don't know what's happening to me ...must be my hormones that are changing ..it's not just me that's becoming softer shape wise but also emotion wise too. Here I am all alone having my little tea party, I might be here in person by myself but throughout the morning I've been making some new friends in cyber space. Thanks ARTSYMAMA for a wonderful idea and initiative. 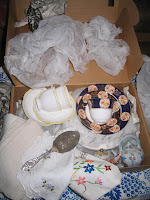 What a morning ...drawling over some wonderful blogs and websites, seeing such wonderful china and linen......well this was just too much, I decided to get out all my old china that I carefully wrapped up and put away, so that the kids wouldn't ruin them. I've decided that they are no longer to be hidden away and need to go back on display.....wasn't that the whole idea in the first place to be seen and used. 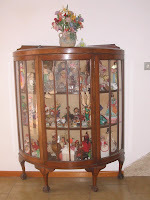 So linens will be washed and old china washed , I've decided that I will display them in my old antique English display cabinet.........only one problem will now have to find a new place for my collection of dolls !!!!!!!!!!!!!!. Looking forward to continuing the day dropping in on other peoples tea parties. There's an International tea party going on which has been hosted by the hostess with the mostess http://artsymama.blogspot.com. Here in Italy today it is miserable, damp and cold....greyt start to spring !!!!! Up until today the weather has been up in the 18- 19 degrees sunny and hot, short sleeve weather, everything has already flowered , seened so strange to see the end of February and beginning of March blooming with colour . Also first thing this morning I had the boiler man in to give the boiler its annual check-up, I suppose you could say it's been SPRING CLEANED !!! LOL. I'm a tea drinking addict, I drink about 10 mugs, yes mugs not cups, of tea a day , whatever the weather may be. I drink my tea the traditional English way with milk and sugar and believe it or not I prefer to drink a nice hot cuppa at meal times .!!!!!!!!!!! horror of all horrors.....my hubby after nearly 30 years still can't come to terms with it. I call my cup of tea by different names...............a cuppa, a brew, a cup of char. In the Uk they have teabags in all different shapes, traditional sqare ones, round ones, pyramid shape ones, ones that you pull two strings so as to squeeze the life out of it !!!!!!!!!! I don't care as long as my tea bags come from the UK, as I don't care much for the weak tea they have here in Italy which is more adapted to drink with lemon and fruits. I have my tea bags sent out to me and now that my kids like a cuppa too it's costing me a fortune !!!!!!!!!!. I like to make my tea by putting milk and sugar in the mug first and then adding the boiling hot water.....I know a lot of people say this isn't the correct way and that the milk should be added after the boiling water.........this is a debate that has been going on for years.......something like the egg and the chicken question...How to you make your cuppa? would love to know. Onw thing I do know is that the Italians really give me strange looks and give strange comments about drinking tea with milk !!!!!!!!!!! I'm English ( sorry British !!! ) what do they expect !!!! LOL. 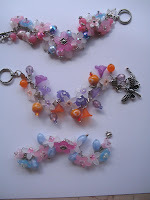 Last night I made 3 charm bracelets ready for spring, they are made with lucite flowers and glass beads , they are so light to wear, have to say I'm pleased with them. Isn't she just wonderful this doll with her lovely big head, she's a pattern by Missy Ballance of http://littlemissyprimitives.com. I made her about 2 years ago and have never wanted to give her away, I'm a hoarder by nature so most of my handmade gifts never get given to the would be receiver...........they get put on a shelf in my house !!!!!!!!!!!!!!! This is a raggedy fairy that I finished off today, poor thing has been a UFO ( unfinished object) for more than a year or two, no wonder she has that expression of surprise on her face !!!!! LOL. Can't remember off the top of my head, but she's a variation of a plumtickled pattern I got some years back. I'm taking part in a FUNKY JOURNAL swap based on the COLLAGE UNLEASHED book techniques by TRACI BAUTISTA. I'm having a greyt time doing it and am just trying to go with the flow. I hope the person who receives my journal will enjoy looking at it as much as I've enjoyed doing it. I'm having some problems trying to find some materials here in Italy, either because I really can't fine them or don't know what the equivalent is in Italian. I've been fortunate that some artist friends have come to my help and sent me what I need. I would like to say a BIG THANK YOU to all of them, it's very much appreciated. 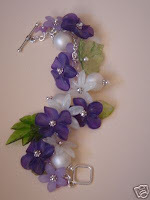 Yesterday I decided to make a beaded flower bookmarker with some very colourful acrylic flower beads that I bought . 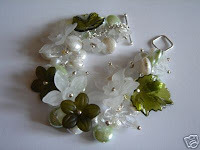 Will have to practice a bit more attaching the flowers to the chain, just couldn't get the hang of wrapping the wire. I'm used to doing it Ok with ordinary round beads but with these flower shapes was a whole new kettle of fish for me. Think I will try and make some charm bracelets as gifts as these acrylic beads are so light. I might even use them on a FUNKY JOURNAL swap that I'm participating in , might even call the journa Funky Flower Power !!!!! LOL. I've fallen in love with some charm bracelets made by an e-bay seller in turkey. 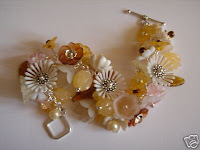 I just love the way she coordinates the colours with the delicate lucite flowers and beads and by using the lucite, resin and acrylic beads the bracelet is so light. Over the past year I'm starting to have a nice little collection, problem is when I buy them as gifts for others I'm so tempted to keep them for myself!!!!!!!!!!!!. 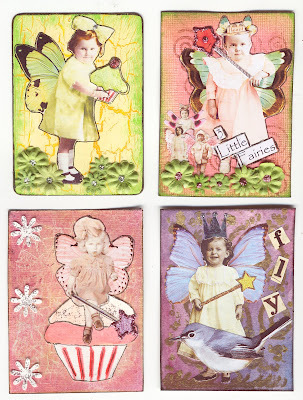 These are some ATCs that I made for a swap based on using one or more of Bernie Berlin's techniques from her book. Had great fun doing them, one is using the metal foil tech, telephone book page tech, and inky layers tech. 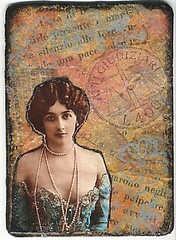 Vintage collage images are from Artchix studio. I've decided to take part in another swap where I will have to make 60........so I had better go and start. Well JoAnna Pierotti my American art friend, had her first chemo session the other day but also had a special surprise. In November Lelainia put a call out on her blog http://tatterededge.blogspot.com calling for artist to make some art for JoAnna so as to make a chunky book and a charm bracelet, well here are the finished items on Lelainia's flickr http://www.flickr.com/photos/19674523@N00/sets/72157594521084917/show/, this is the slideshow version. Was a real pleasure to be part of this along with all the other artists and a big thank you to Lelainia for putting the chunky book and bracelet together. ATC guilty or not guilty? New ATC , another tech from Bernie Berlin's book . 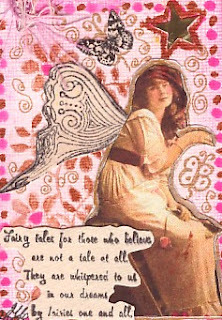 Here I used vintage papers, coloured once dry with ink , embossed stamped image and used a vintage postcard image. These are some background techniques I've been playing around with since having Bernie Berlin and Traci Bautista's books . For all the samples I've used paper for watercolours and acrylics. With the top 2 what I've basically done is transfered the excess alcohol ink colours on some metal foil tape by putting the paper on top of the tape and passing over with a brayer. Then on another piece of metal foil tape I've dabbed off the excess alcohol ink with baby wipes and the dabbed randomly over the paper . On the bottom 2 I've just transferred excess alcohol ink onto a baby wipe and dabbed over paper randomly, the bottom right one I used a clear embossing ink pad and inked randomly over paper and then used gold embossing powder that I then heated with a heat gun. I'ts like being back at school again...................the best background image is me !!!!!!!!!!!!!! ....what with all the excess colours and materials on my hands. A Happy Crafty New Year to everyone. Here's an ATC I did using the metal foil technique explained in Bernie Berlin's new book, 'ARTIST TRADING CARD WORKSHOP'. This book is a must for all ATC enthusiasts and 2 b ATC enthusiasts, it's pleasing to the eye and the techniques are explained in clear simple English. I also used a vintage image that I coloured in using colours for black and white photographs, the flowers are what my friend uses for doing her scrapbooking. Talking about scrapbooking , I was trying to find some Italian scrapbooking blogs but I just seemed to find the same old ones over and over again on all the blogs, with the same old LO's and ideas from the USA. Is it that there are far and few between scrappers here in italy ???? !!!!!!!! or that they want a monopoly and have the glory for themselves and not let others into their lucrative club ????!!!!!!!!! Off to play with some more techniques from Bernie's book.